Sea turtles journey from North Carolina’s beaches as hatchlings, then travel to the relative safety of the Sargasso Sea. 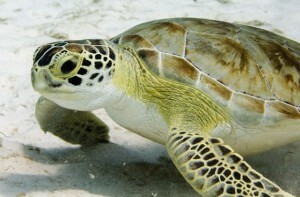 These turtles are believed to remain in the sargassum seaweed for 1 to 10 years for protection. 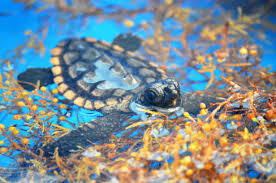 As young sea turtles, they spend their days floating in the sargassum, on the surface of the water. The dark plant matter absorbs the heat of the sun, keeping hatchlings warm. Sea turtles also feed on the small fish and invertebrates that the Sargasso Sea hosts, while hiding from larger predators, such as birds, large fish and sharks. Young sea turtles also face the threat of human impact. Hatchlings often die from ingesting the marine debris that pollutes the ocean. Sea turtles will remain in the safety of the sargassum beds until they reach juvenile size. At this point, they will be about the size of a dinner plate, between 8-12 inches. The juveniles will then typically migrate back towards the coastal waters off of the east coast. Juvenile turtles and older immature turtles (called sub-adults), use bays, estuaries and coastal areas as foraging grounds to develop and grow strong. These areas may range from New England down along the east coast to Florida. Scientists estimate that sea turtles reach reproductive maturity anywhere from 10 to 50 years of age, depending on the species. One impact on the length of time until maturity, is the quality of their nutrition. The ability for young sea turtles to get a proper diet, as they feed in the Sargasso Sea, is vitally important. Once mature, females and males will leave the foraging grounds to mate. Then, female sea turtles typically journey back to the same nesting area in North Carolina from where they hatched, only a few decades before. They will lay their own eggs, beginning the life cycle again!